Podcast: Does punctuation matter? Yes, it does! Hello, everyone. No episódio de hoje do podcast Inglês Online, eu falo sobre a importância de se pontuar frases corretamente, com exemplos de mensagens em inglês que podem ter significados completamente diferentes dependendo de como são lidas. So today I came across something that sparked my interest and I thought it would make good subject matter for this episode. I’m sure many of you have come across one of those images on Facebook with a phrase that can be read several different ways according to how you punctuate it. Obviously, the meaning will change depending on how you read it, and that’s the whole point. I guess one of the most well-known ones is the “let’s eat grandma” meme. This one has been widely circulated around social media and usually comes with an image of an old lady… Probably for impact. And the words are exactly the ones I said before, only there are two versions. The first one is Let’s eat, grandma – which has a comma after “eat”, and means that someone is asking their grandma to join them and start eating. The second version has no comma: let’s eat grandma. So that would be some pretty savage grandkid suggesting they should have grandma as a meal. The image closes with “punctuation saves lives!” Have you seen it on your social media timelines? That’s not the one I saw today, though. 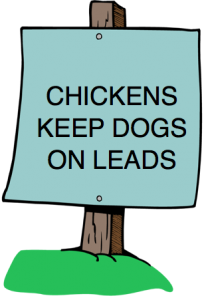 The one that piqued my interest reads “Chickens keep dogs on leads”. It was seen on a road sign by someone and this person photographed it. I can’t post the picture here since I don’t have the rights for it but I’ve put together an image that sort of gives you an idea. So this is a nice one since there are multiple ways to interpret this sentence. Before I get into this, let me ask you: take a look at the image I posted for this episode and read the words. What’s the first interpretation that came to your mind after you read it? I’m curious. When I first read it, my thought was – whoever put up this sign is calling me a chicken and asking me to keep my dog on a lead. Now, chicken is a word that can be used in the United Kingdom to refer to a woman and it’s usually not an insult. So this person would be asking all women that are passing by to keep their dogs on a lead. If you’re a guy, you’re off the hook apparently. So that’s one way to read it. The second way to understand it can be – this person is telling actual chickens to keep their dogs on leads. By the way, a lead in this case is a long piece of plastic or leather that is attached to the dog’s collar, so the dog owner can direct and control the dog. And finally, the way I think whoever put up this sign intended for it to be understood. “Chickens. Keep dogs on leads” meaning, there are chickens running around in this area, so please keep your dog on a lead to prevent it from chasing after a chicken and potentially hurting it and so on. And that made me think about punctuation in general and how it can, when misused, really get in the way of understanding what the other person is trying to say. I know I’ve run into this problem before – someone sent me a message and I had a hard time figuring out what they wanted to say. Have you ever had a similar problem? Let me know in the comments, and talk to you next time! That’s right, Rih. It can be, though. Hello, Ana. Another problem on misusing puntuation is on Whatsapp messages. Sometimes it’s impossible to understand what people say! Hello Ana, recently I heard something like that related to the word “milk” ” the milk had gone bad” it can mean that the milk has spoiled or it has committed a crime.it is Quite strange, isn’t it..but I google it and there are some pictures of a milk with a gun or stuff like that. That is a pun, or “trocadilho”, since “go bad” means “become unsuitable for consumption” as well as “become a bad person, a criminal, etc”… Got it? Previous Post Como falo em inglês: Eu te defendi quando você brigou com ela Next Post Como falo em inglês: Não entendi. Que você disse?